The 1998 commemoration of the bicentenary of Bonaparte’s arrival in Malta was conceived by Stephen A. Petroni and Alfred Umhey, who were later joined by Stefan Roda and Ann Petroni in the planning stage. In turn, this initiative gave birth to the Historical Reenactment Group of Malta or HRGM with the participation of Nicky Bianchi, Michael Stroud, Martin Degiorgio and many veterans of today’s Napoleonic re-enactment scene. 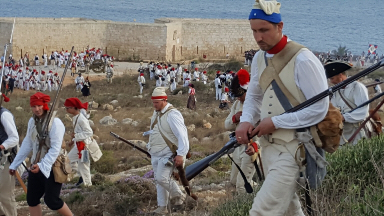 The spectacular event brought together 450 Napoleonic re-enactors from 12 countries and spanned eight days of displays held in various locations in Malta and Gozo. It was the first of its kind ever to be held in the Islands. The Malta Campaign of 1798 marked the end of almost 270 years of the rule of the Hospitaller Order of the Knights of St John. During their tenure of power, Maltese corsairs were feared throughout the Mediterranean and the Order’s power, fame and riches grew with every vessel captured. However, the French Revolution brought with it a loss of territories and revenue for the Order. Moreover, the Order’s internal politics weakened its resolve to defend the islands. When General Bonaparte arrived on the island with his troops in June 1798, it did not take him long to take Mdina, which at the time was the Island’s capital. The island of Gozo was ably defended by the Maltese militia. However, with practically no assistance from the Order they were forced to surrender the Citadel. Just 3 months into the occupation the Maltese rose in rebellion, forcing the French to seek refuge within the fortifications of Valletta. A Maltese delegation sought the assistance of Admiral Nelson, who provided arms to the insurgents and eventually landed British marines on the island. Eventually the beleaguered French garrison was forced to surrender to the Maltese and British troops on 5th September 1800, with the promise of military honours and a safe passage back to France. A year and a half ago, Martin de Giorgio, the present president of the HRGM, decided to revisit the re-enactment event of 20 years ago and in the first week of June, just 4 weeks ago, 550 Napoleonic military re-enactors from 19 countries worldwide relived the emotions and added new ones to an event that was another great success. Martin and his assistant Louise-Anne were dogged with last minute cancellations and other problems but they pulled their forces together and overcame all obstacles. As a regular attendee of the annual HRGM Ball and Weekends, I wasn’t going to miss this historic event for the world and I registered with curiosity and anticipation. 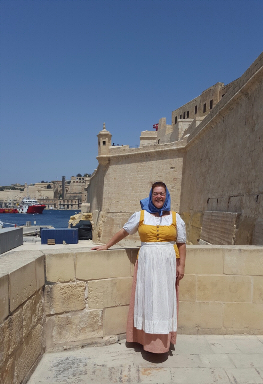 In April Marie Bianchi gave me the book “Women in 18th Century Malta” filled with images of the clothes worn by both workers and society ladies and I began searching for suitable fabric to make myself a couple of camp follower outfits similar to those paintings. It wasn’t an easy task but I eventually found the website of a UK company and luckily the fabrics that arrived were perfect! I also found some suitable fabric in my vast stash of material, one of the benefits of a being a cloth hoarder. The original fabric woven by the Maltese women was an indigo blue with white stripes, both fine and broad. No-one is producing this cloth any more and it’s difficult to find something similar. Such a pity! This was my first reenactment as a camp follower. Back in 2013 I was lucky enough to live in the camp of the Leipzig bicentenary event as a guest of the 113th line infantry regiment, sleeping in a tent and eating with the others, but I wore my high society outfits. Now I finally had a taste of dressing “down” and it was a liberating experience!! My only regret was that I didn’t have a period water bottle to truly play the role of cantiniera. And my canvas bag definitely needs a good shoulder strap. The event officially began on Tuesday 5th June and I flew into Malta’s airport at lunch time. I missed the first battle at Porte des Bombes at Floriana but caught the very end of the French advance on Valletta with the Order’s troops opposing. That evening the troops ate their dinner in the main square of the village of Naxxar. Excellent braised chicken drumsticks and rice with vegetables. Each evening the troops ate dinner in a different piazza on the island, followed by concerts and dancing. The food was always delicious, especially given the numbers of people to feed. The HRGM dancers demonstrated English dances from the period in the square. My first taste of battle was the next afternoon on the hillside behind the fort at Mistra Bay and it was marvellous! The canon fire and the advancing French army, pushing the Order’s forces up the steep and rocky hillside, was at first quite frightening and Marie and I had to find a safe spot on the side. This was soon overrun with fighting soldiers and we was forced to clamber back down to the now unoccupied fort. There I met Kim Krawiec, a cantiniera and vivandiera (selling both water, brandy and pies and pastries to all and sundry) and I bought one of her ricotta pastries. I’m posting a photo Marie took of her on that rocky promontory that is Selmun Peninsula. The next day, June 7th, Fort St. Angelo was open to the public. The French army was billeted there and we had a chance to see their sleeping quarters and explore the Fort. Marie and I visited the private part of the Fort dedicated to the last Knights of Malta, with private apartments and gardens and fountains. An oasis of cool calm. That evening I donned a ball dress from the 1798 directoire style (with the train pinned up and feathers in my hair) and attended the exclusive officer’s Ball at the San Anton Palace, the official residence of Malta’s president. She graciously allowed us to be the first ever guests to hold a private function in the Palace and garden. The location was perfect, the evening balmy and the dancing as wonderful as it always is with the HRGM dancers and the orchestra playing music orchestrated by David Mallia. It was good to have some of the officers present and to find that many were excellent dancers once they had mastered the Regency choreography. Over the next couple of days the skirmishes in the streets of the various villages around the island became more and more realistic as the soldiers uniforms became increasingly covered in the white Maltese dust and sweat from days of forced marches. The troop’s sheer fatigue from little sleep and heat added to the overall effect for those who came to watch and I imagine that for those participating, the memories will be clear and strong. The last two days were spent on the island of Gozo. Everyone travelled over on the ferry and then caught buses to Ramla Bay where the Order’s forces opposed the landing of the French troops. In the afternoon the attention was focussed on the Citadel where the French accepted the Maltese surrender. That evening we danced in a frescoed hall in one of Gozo’s Ministry buildings right on St Francis square in Rabat. Some soldiers and camp followers joined in, which was what we had been hoping for all along. The final day of the event was Sunday 10th June. 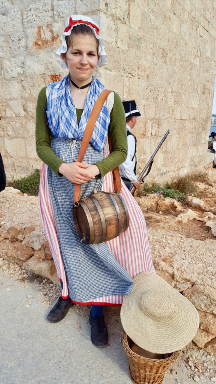 The re-enactment recalled the uprising of the population of Gozo against the French who then retreated to the Citadel and remained under siege until they finally accepted the British terms of surrender and departed the island. The British occupied the Citadel and in 1800 the British finally drove the besieged French from Valleta and Malta began her 165-year period under British rule. What a week it was!! So many events and battles, so many new friends and good times had with old. I was sad to leave and come back to “normality”. My congratulations go to Martin and Louise-Anne for a marvellous event and I look forward to my next event as a cantiniera! Risale ormai al 1998 la commemorazione del bicentenario dell'arrivo di Bonaparte a Malta che fu concepita da Stephen A. Petroni e Alfred Umhey, a cui si aggiunsero in fase di progettazione Stefan Roda e Ann Petroni. A sua volta, questa iniziativa, ha dato vita successivamente al Gruppo di Rievocazione Storica di Malta (HRGM) con la partecipazione di Nicky Bianchi, Michael Stroud, Martin Degiorgio e molti veterani dell'attuale scena di rievocazione Napoleonica. L'evento spettacolare ha visto coinvolti 450 rievocatori napoleonici provenienti da 19 paesi e si è svolta durante otto giorni pieni di eventi tenutesi in varie località tra Malta e Gozo. E' stato il primo evento di questa portata ad essersi mai svolto nell'arcipelago. La campagna di Malta, del 1798, segnò la fine di quasi 270 anni di dominio dell'Ordine Ospedaliero dei Cavalieri di San Giovanni. Durante il loro mandato, i Cavalieri appoggiarono i corsari maltesi, temuti in tutto il Mediterraneo, facendo in tal modo aumentare, ad ogni nave catturata, il loro potere, la loro fama e le loro ricchezze. Tuttavia, la rivoluzione francese comportò per l'Ordine perdite di territori e di entrate, mentre la politica interna indebolì la loro stessa determinazione a difendere le isole. 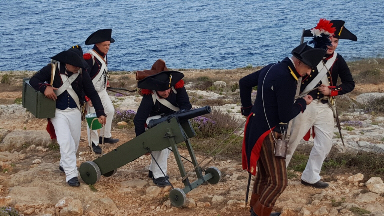 Quando il generale Bonaparte arrivò sull'isola con le sue truppe, nel giugno del 1798, non gli ci volle molto per prendere Mdina, che all'epoca era la capitale dell'isola. L'isola di Gozo, pur essendo abilmente difesa dalla milizia maltese, senza l'assistenza dell'Ordine, cedette ben presto la Cittadella. Tuttavia, a soli 3 mesi dall'occupazione, i maltesi si ribellarono, costringendo i francesi a cercare rifugio nelle fortificazioni de La Valletta. A quel punto i Maltesi decisero di chiedere l'aiuto degli inglesi che inviarono l'ammiraglio Nelson, che fornì armi agli insorti e riuscì a sbarcare con le sue truppe sull'isola. Alla fine la guarnigione francese assediata fu costretta ad arrendersi alle truppe maltesi e britanniche il 5 settembre 1800, con la promessa di onori militari e un passaggio sicuro in Francia. Un anno e mezzo fa, Martin de Giorgio, l'attuale presidente dell'HRGM, ha deciso di riorganizzare l'evento di rievocazione tenutasi 20 anni fa e nella prima settimana di giugno, 550 militari napoleonici rappresentanti di 19 paesi del mondo hanno rivissuto le emozioni, e aggiunte di nuove, ad un evento che è stato un altro grande successo. Martin e la sua assistente, Louise-Anne, pur nelle difficoltà di cancellazioni dell'ultimo minuto e altri problemi, hanno unito le loro forze e superato tutti gli ostacoli. Come partecipante regolare dell'HRGM Ball and Weekends annuale, non mi sarei mai persa questo evento "storico" per il mondo dei rievocatori e mi sono registrata con curiosità e aspettativa. Ad aprile Marie Bianchi mi ha regalato il libro "Women in 18th Century Malta" con immagini degli abiti indossati sia dai lavoratori che dalle donne dell'epoca della società e ho iniziato a cercare tessuti adatti a farmi un paio di abiti da "camp follower" in qualità di cantiniera, simili a quelli dei dipinti. Non è stato un compito facile, ma alla fine ho trovato il sito web di un'azienda britannica e per fortuna i tessuti che sono arrivati erano perfetti! Ho anche trovato un tessuto adatto alla mia vasta scorta di materiale, uno dei vantaggi di essere un' "accaparratrice" di stoffa. Il tessuto originale tessuto dalle donne maltesi era di un blu indaco con strisce bianche, sia fini che larghe. Nessuno produce più questo tessuto ed è difficile trovare qualcosa di simile. Che peccato! Questa è stata la mia prima rievocazione come "cantiniera". Nel 2013 ho avuto la fortuna di vivere nel campo del bicentenario di Lipsia come ospite del 113 ° reggimento fanteria, dormire in una tenda e mangiare con gli altri, ma indossavo i miei abiti da "alta società". Ora ho finalmente avuto il gusto di vestire in abiti da "lavoro" ed è stata un'esperienza liberatoria! Il mio unico rimpianto è stato il fatto che non avevo una bottiglia d'acqua del periodo per interpretare veramente il ruolo della cantiniera. E la mia borsa di tela ha sicuramente bisogno di una buona tracolla. L'evento è iniziato ufficialmente martedì 5 giugno e sono volata all'aeroporto di Malta all'ora di pranzo perdendo la prima battaglia a Porte des Bombes a Floriana, ma sono comunque riuscita a partecipare alla fine dell'avanzata francese su La Valletta con le truppe dell'Ordine che si opponevano. Quella sera le truppe hanno cenato nella piazza principale del villaggio di Naxxar. Ottimo pollo brasato e riso con verdure. Ogni sera le truppe cenavano in una piazza diversa dell'isola, cena a cui seguivano concerti e danze. Il cibo e' sempre stato delizioso, soprattutto considerando il numero di persone da sfamare. I ballerini di HRGM hanno allietato le serate con danze inglesi del periodo storico interessato. Il mio primo assaggio di battaglia è stato il pomeriggio successivo sulla collina dietro il forte di Mis-tra Bay ed è stato meraviglioso! Il fuoco dei cannoni e l'avanzata dell'esercito francese, spingevano le truppe dell'Ordine su per il pendio ripido e roccioso, facendoci un po' paura così con Marie Bianchi abbiamo dovuto trovare un posto sicuro. Il nostro posto è rimasto sicuro però per poco tempo poichè subito dopo è stato invaso dai soldati combattenti, costringendoci a inerpicarci verso il forte ormai espugnato. Lì ho conosciuto Kim Krawiec, cantiniera e vivandiera intenta a vendere acqua, brandy, torte e pasticcini a tutti quanti e ne ho approfittato per comprare uno dei suoi deliziosi dolci alla ricotta (la foto di Kim la ritrae sul promontorio roccioso della penisola di Selmun). Il giorno seguente, il 7 giugno, Fort St. Angelo era aperto al pubblico. L'esercito francese era allocato lì e abbiamo avuto la possibilità di vedere i loro dormitori ed esplorare il forte. Marie ed io abbiamo visitato la parte privata del Forte dedicata agli ultimi Cavalieri di Malta, con appartamenti privati, giardini e fontane. Un'oasi di calma fresca. Quella sera ho indossato un abito da ballo del 1798 stile direttorio (con le piume tra i capelli) e ho partecipato all'esclusivo Ballo degli ufficiali al Palazzo di San Anton, la residenza ufficiale dell'attuale Presidente di Malta. Ci ha gentilmente permesso di essere i primi ospiti in assoluto a tenere una funzione privata nel Palazzo e nel giardino. La location è stata perfetta, la serata è stata mite e il ballo è stato meraviglioso, come sempre con i ballerini HRGM e l'orchestra che suonava musica orchestrata da David Mallia. E' stato bello avere la presenza di alcuni degli ufficiali coinvolti nelle battaglie e scoprire che molti sono eccellenti ballerini e sono pienamente padroni delle coreografie Regency. Nei due giorni successivi le schermaglie nelle strade dei vari villaggi intorno all'isola sono diventate sempre più realistiche mentre le uniformi dei soldati erano sempre più coperte dalla bianca polvere maltese e dal sudore dei giorni delle marce forzate. La truppa, affaticata dal poco sonno e dal caldo, hanno aggiunto una connotazione di "realtà" a tutto l'evento fornendo, al pubblico che ha assistito, una immagine vera di quella che dovevano essere le battaglie dell'epoca, lasciando sicuramente ricordi indelebili. Gli ultimi due giorni sono stati impegnati sull'isola di Gozo. Tutti hanno viaggiato sul traghetto e poi hanno preso gli autobus per Ramla Bay, dove le truppe dell'Ordine si sono opposte allo sbarco delle truppe francesi. Nel pomeriggio l'attenzione si è concentrata sulla Citadel dove i francesi hanno accettato la resa maltese. Quella sera abbiamo ballato in una sala affrescata in uno degli edifici del Ministero di Gozo, proprio in piazza San Francesco a Rabat. Alcuni soldati e seguaci del campo si sono uniti a noi (ed era ciò che speravamo). L'ultimo giorno dell'evento è stato domenica 10 giugno. La rievocazione ha rappresentato la rivolta della popolazione di Gozo contro i francesi che si ritirarono poi sulla Citadel e rimasero sotto assedio fino a quando non accettarono definitivamente i termini britannici di arresa e se ne andarono dall'isola. Gli inglesi, dopo l'occupazione della Cittadella e la cacciata dei francesi da Malta, hanno iniziato il loro periodo di dominio durato 165 anni. Che settimana!! Così tanti eventi e battaglie, tanti nuovi amici e bei momenti passati con quelli vecchi.Tornare alla normalità è stato triste! Le mie congratulazioni vanno a Martin e Louise-Anne per questo evento meraviglioso e non vedo l'ora che arrivi il mio prossimo evento come cantiniera!